Data corruption is one of the major issues that affect the Excel file formats. It should not be an issue with your file, but with the high amount of data that it contains. If you found your Excel files corrupted and struggling to retrieve data from these files, we have a tool that performs the task with an exemplary ease. Excel file format is one of the most important database solutions for your complex calculations and other complicated data. They are primarily used for large sets of data and the complex calculations involved within. These files do contain a lot of data and such a huge amount of data can indeed be at the risk of damage and corruption. That is exactly where you would find the tools like Stellar Phoenix Excel Repair to be utterly helpful. They can help you fix the errors so that you can continue working with your documents. The Stellar Phoenix Excel Repair is indeed your friend in need if you are trying to recover your corrupt Excel files without any hiccups. 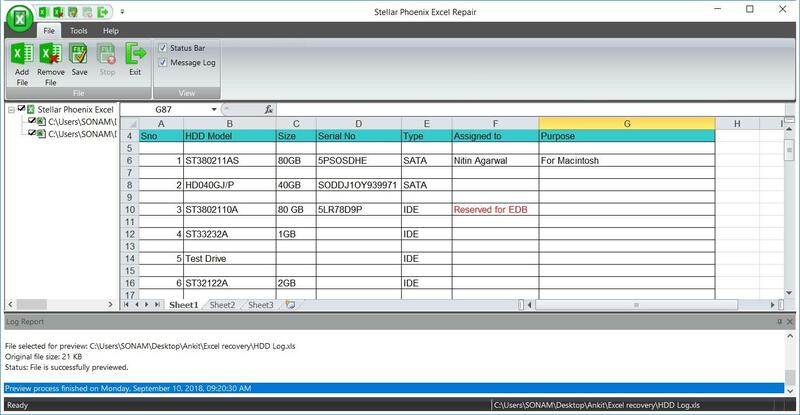 What is Stellar Phoenix Excel Repair Tool? Repair one or more corrupted files simultaneously. Offers you a preview of the content of the Excel so you can select only the useful content to recover. It is capable of recovering all type of Excel objects like Charts, Formulas, Sort, Cell comments, Filters and of course the tables. It recovers Excel data without doing any modifications to the formatting or layout of the Excel file. Its damage repair works by individually identifying the corrupted objects, repairing and restoring them to their original state. Is capable of dealing with all known Excel corruption errors like unrecognizable format, unreadable content, cannot open the file. 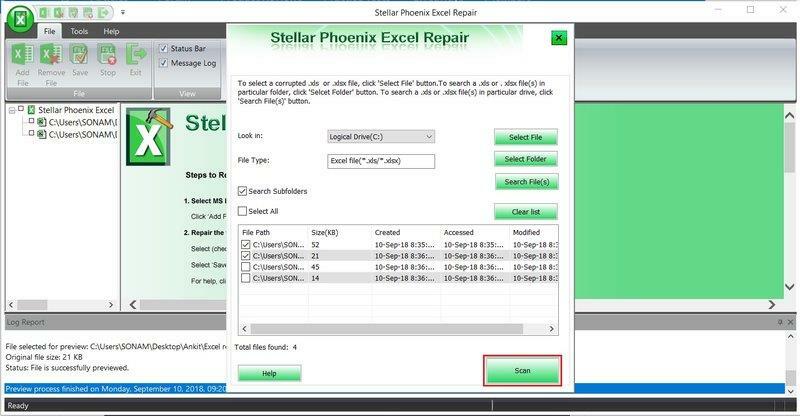 How to use Stellar Phoenix Excel Repair Tool? 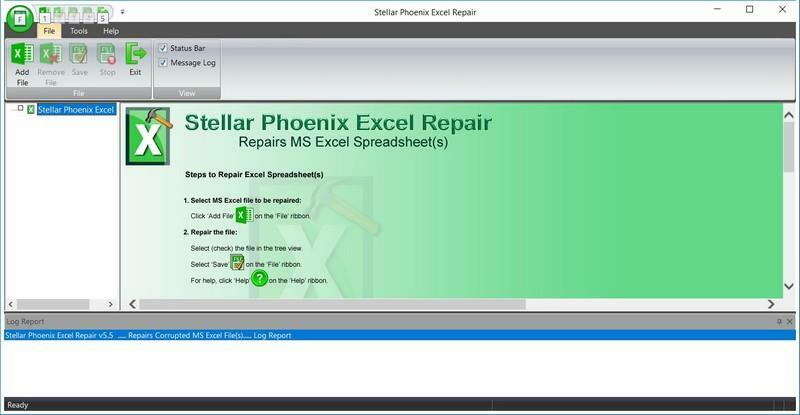 Download and install Stellar Phoenix Excel repair tool. The software home screen has a very simple UI with few options to make sure that there is no confusion on what to do from there. Click on Add File button in the menu bar and you will see a window asking you where to look in for Excel files. You can select an individual file by navigating to it by using the "Select File" button or you can search a whole folder or sub folders using Select Folder button followed by Search File(s). Select the file you want to Scan by checking the check box and click on Scan. The scanning completed quickly for us but might take time if the file size is too big. Once all the files are scanned a tree list view is created where you can select an individual file and see the preview of the recovered content. If the data looks fine to you in the Preview, just use the right click on the file in the left side bar tree view, click on Save and select a destination path to save your recovered Excel file. We recovered 2 Excel files simultaneously and the recovery process was complete within a blink of an eye. It uses your own Microsoft Excel software to preview the content and hence has a very light weight installation package. It supports MS Excel versions including 2016, 2013, 2010, 2007, 2003, and 2000 but we found during our testing that it does not recognize Office 2016 Home and Students editions but works perfectly on the Professional Office Edition. Also, if you don't have MS Office installed you will not be able to use the tool since it checks for MS Office presence at the start itself and doesn't let you proceed any further without it. We didn't find any other problem with the tool. There are 2 licenses available for the tool - Single User license and Technician license which seem quite affordable at Rs.2,500 and Rs.12,999 respectively. Using the tool was a breeze for us and we definitely recommend Stellar Phoenix Excel Repair if your Excel files have gone corrupt and you want to recover that precious data safely and quickly.